creative savv: So, How Was Your Easter? I hope you had a wonderful day with family and friends on Easter. My day was busy (surprise, surprise). I packed a lot into 24 hours. We decided on an Easter lunch following church, as I had a project to work on in the evening. That's a pretty decent meal for a holiday, considering I couldn't get out to buy special ingredients. The bonus was that I made enough of everything except the pie, to have leftovers for dinner on Monday! Sounds like a delicious and bountiful meal! You did great using what you had! It turned out well, so I was very glad for that. 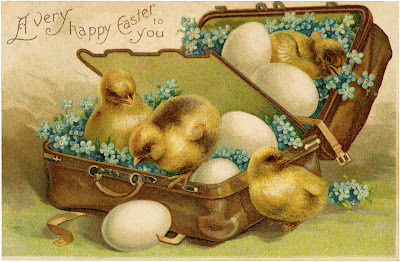 I hope your Easter was lovely! Your menu sounds great. I think you did a good job with what you had on hand. I'm sorry your car broke down and hope you will get it back up and running soon. Thank you, Belinda. It all turned out well. I may get my car back on Thursday. We don't live walking distance to any businesses, so I feel very stranded. But I have a lot of take care of in this week, so time will pass quickly. We had my parents and my brother and his girlfriend as well as my two kids and me and hubby. It was a very simple dinner and when it was all over, I only had a few meatballs, some green beans and ham leftover. The dessert had a little bit leftover but my brother took some home. My two kids took some leftover meatballs and green beans back to school with them and then hubby ate the rest. I do have a couple of packages of ham in the freezer to be used for sandwiches or a casserole. I also did make a bunch of ham broth with the ham bone. I was going to make the green bean casserole with the creamed soup but chose not to instead just a casserole of green beans. Dinner was fun and we had lots of laughs. Oh, I should say my Bunn coffee maker died during our house renovations so now I have pulled out my older percolator since I can't afford another Bunn right now. It makes marvelous coffee. The college kids were home Monday for Easter Monday and about 11 am my daughter and I had to go to the bank and afterward she said she was hungry. We got home and I suggested leftovers from Sunday or soft tacos. She chose tacos since we had just passed a Taco Bell and that made her want tacos. So I made tacos with a huge slab of frozen ground beef. That girl was very hungry--she ate four fully stuffed tacos with cheese, salsa, lettuce, sour cream yogurt. Then my son started with his four and I had one. Hubby called from work saying he was hungry and if he stopped home would I be able to pass him something. Two tacos for him! That whole pan of taco meat was gone within an hour! Lucky for me that I took the day off from work! Hope your car gets fixed at minimal cost. I sure know what it's like to have my hard earned money just falling out of my pocket like a waterfall lately. I have a feeling that you are like me and that there is a little set aside for something like this and maybe it won't "hurt" too much. Your dinner turned out nicely! And especially since you didn't do any special shopping for it. Oh dear, I'm so sorry that your coffee maker stopped working. That would be almost as bad as the car not working, for me, (ha ha). Good thing you have a percolator. I see coffee makes at Goodwill all the time. You may be able to pick up a used one, and salvaged whatever part you need from it, for super cheap, if you get tired of using a percolator, and can't afford a new Bunn right away. Good work on making the taco meat for your crowd. Doing a lunch like that after out running errands always makes me feel great, having resisted temptation to get the fast food. The car will be expensive, but less than buying another car. I'll take the repair costs out of the savings for a new car. It just delays when we can replace this one. So that part is disappointing, but at least we can afford the repairs. I'm glad your Easter was so pleasant and you could spend time with family! No surprise that you were able to have a lovely dinner with what you had on hand. I feel your pain about the car and taxes. Same kind of things happening here. Hopefully with Easter and taxes out of the way, it will be a little slower. And when you get your car fixed, things will seem so easy compared to now even if you're still busy every minute. My burning question for you is how much of Easter dinner did your son make? His cooking skills sound like they are expanding rapidly. I'm sorry you're dealing with car and tax issues, too. It makes me feel so stranded to not have transportation unless I beg a ride from someone. You're right about when the car is finally fixed, life will just slip back into normal routines. One good thing, I knew in advance that I would have a busy couple of weeks, so I canceled a couple of appointments, before this ever happened with the car. At least I'm not disappointed over that. My life will slow down in 2 weeks. I am counting the days! Sorry to hear about your vehicle Lili; we just went through that a couple of weeks ago and for us it was a VERY expensive repair...so here's hoping yours may not be so costly! I am glad you were to have a nice Easter and I will pray that you are back 'cruising' very soon! Oh no, car trouble seems to be rampant, around here! I am so sorry that you went through this just recently and that it was so expensive. Unfortunately, ours will be of the expensive variety. But it has to be done, as you probably felt with yours. Thank you. Easter was nice. I hope your Easter was also lovely, Lisa! Our church has a brunch after the morning service, so I took a couple of (homemade, obviously!) coffee cakes and we all enjoyed goodies for our "second breakfast". My husband usually does the big holiday meals, and this was no exception--we keep it pretty simple--an Aldi's ham, potatoes, green beans, and homemade applesauce that we had frozen in the fall and thawed for the meal. Because of the brunch, we weren't hungry for anything more than that. I pulled out our china to make it more special, and mom joined us. As usual, you pulled off an amazing meal. How blessed your family is! Hmm, graceful, probably not how I'd describe myself as I sat and sat in the parking lot that day. Oh well. Your Easter sounds so nice, at your church. That's a wonderful way to celebrate with church family. Our church has a reception after the services, but it is mostly things like cookies and coffee and juice. I may offer to work at the reception next year, and bring more breakfast-y foods. That's so nice that your mom could join you, and you used your china. I need to do that more often (use my china). I'm glad your Easter was so lovely, Kris! How cool that you were able to pull together an Easter menu with what you had on hand! Very impressive! We had a big car repair last month, too. Not fun. We had a big Easter dinner at my in-laws on Palm Sunday weekend (25 ish people). I made a large portion of that meal, but my FIL made the meat & my SIL made a salad & veggie. Then I made Passover Seder foods (matzo ball soup & haroset) for my daughter's confirmation class on Sunday morning. We hosted a Passover Seder dinner here on Tues. Again, I made most all of that meal. I also hosted a small gathering the night before Easter, but I used pulled pork from the freezer & just bought a bag of chips & made 2 salads & some baked beans. Our friends brought a homemade cheesecake. Blessedly, Easter Sunday was less work for me. I made a big breakfast for our family, but most of that I made the night before. Then I brought homemade rolls (that my eldest daughter had made) & a relish tray to our big extended family dinner with my side of the family at my uncle's farm. Whew! No wonder I was so tired yesterday. Wow, you've had a very busy couple of weeks! But I'm sure that you cherished the time with family and friends. My schedule is still too busy for my liking, but it will slow down considerably in a little over a week. Did your advance planning for Easter...save the day? I remember your post awhile ago about that. With taxes and Easter happening the same weekend, sadly our children were very busy. Our daughter had to work on Easter, and her other job is a tax preparer, so this is the worst week for her, and our son has some major tax issues from previous years. I haven't even called their families on Easter Day because I'll just do it this week after tax deadline. Our grandchildren see us so often, I don't mind a peaceful day on the holiday day itself. Sorry to hear about your car trouble at such an inconvenient time. When it rains, it pours. Hopefully your coming weeks will be just the opposite....full of sunshine and good news!! The planning was all there, yes. The execution of the plan was not quite what I had hoped. I did bake the ham the day before, and that saved a lot of time on Sunday. Saturday afternoon, I decided that I would do a simpler pie than rhubarb, so that shaved time and work, too. One of my daughters helped me on Sunday morning, so we were able to throw it all together in a hurry. I'm lad we did it as a lunch, instead of a dinner. There's some real value in doing it that way -- once lunch is over, the hard work is all done. In contrast to having a holiday dinner, where I find myself cooking all day. Oh gosh, your kids have their hands full right now, don't they? A little quiet time for you and your husband is probably welcome. Your grandkids were just with you for their spring break, recently, right? I'm sure the memories of the fun from just a couple of weeks ago will keep you company, until the next time you can have them all over. Have a lovely evening, YHF! It's funny, when I check the clock, and see that you are still in prime evening hours, yet I'm thinking that I need to go to bed, soon. Another few hours and some of the others will be getting up for the day! So true, why lunch is easier when you can break the preparation over two days, instead of relying on doing it all in a day. Just a word about an awesome spiral ham deal at Target, 50% off using the Cartwheel app. The hams were priced at $1.89/lb at our stores. We bought two ham halves and will bake them together and freeze the sliced portions for the grandkids when they visit next month :) This time I will remember to roast the ham bones without a foil cover! Hmmm...I wonder if checking your next day posting is the reason I'm up reading my tablet in the wee hours? Also, a new daily challenge for "spider solitare".